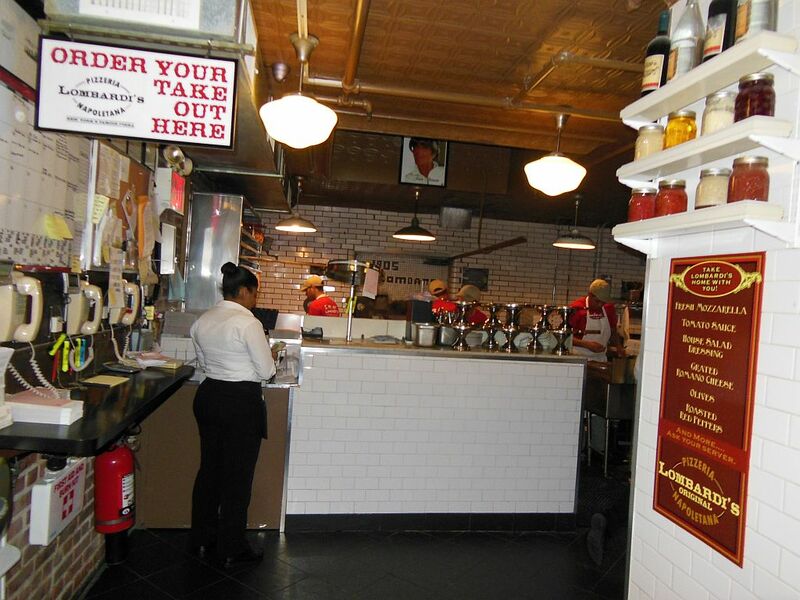 Lombardi’s Pizza in Little Italy–America’s First is Still One of its Best! Whenever I go home to New Jersey for a visit, I get to experience adventures in New York City both as The Pizza Snob and Music City Mike. On a recent visit, I borrowed Dad’s brand new Honda Accord (courtesy of Hurricane Sandy) and drove to lower Manhattan’s City Winery to hear the powerful and passionate sounds of Alejandro Escovedo planning to bookend the show with pizza stops before and after. Parking just outside the Holland Tunnel, I braved the early evening’s winter chill and walked straight across Spring Street to my pre-show stop on the northern edge of Little Italy. Just one block east of its Mulberry Street epicenter– on the corner of Mott and Spring–I came upon the historic Lombardi’s Pizza. 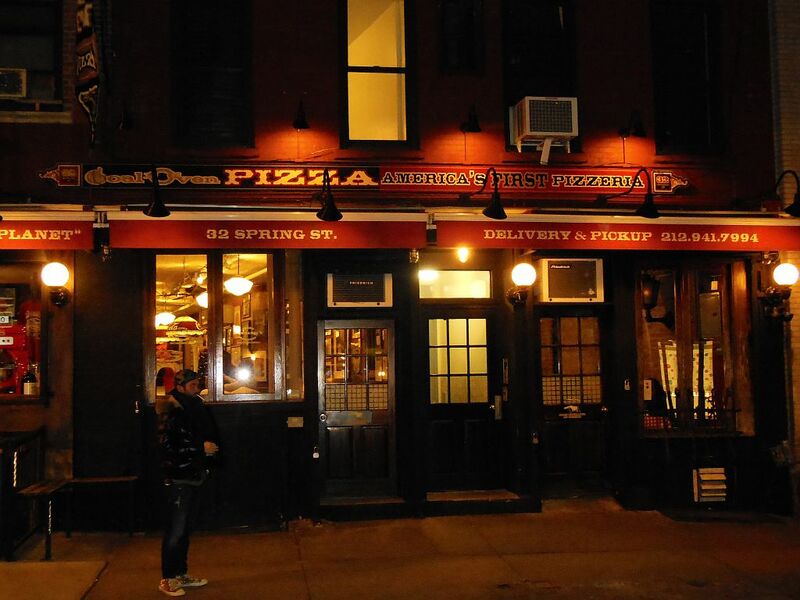 While our family has made a habit of dining in Little Italy at least once per visit, I am embarrassed to admit that this would be my first time at America’s oldest pizzeria. Over 100 years ago, Lombardi’s is where an Italian immigrant’s culinary creation in a coal-fired oven ignited the genesis of one of our nation’s most coveted food treasures. 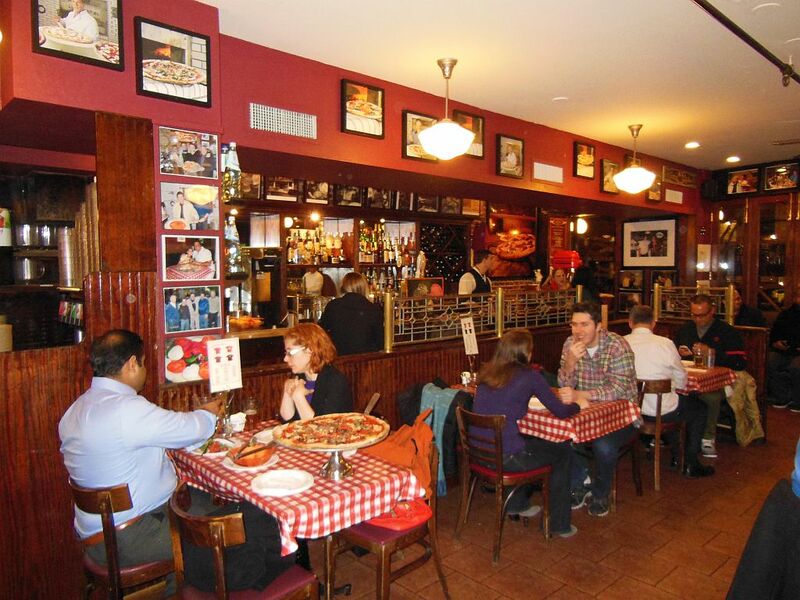 Lombardi’s has the loose, casual feel of a typical Little Italy restaurant. It is now a few doors down the block from its original 1897 location and has also since expanded to better accommodate the crowds. I got seated in the original pre-expansion long narrow room in full view of their famous oven. The date on the historic white brick, coal-burning oven still reads “1905” which is the year when Lombardi’s was first licensed. I was quite excited since this would also be my time to eat coal-fired pizza. 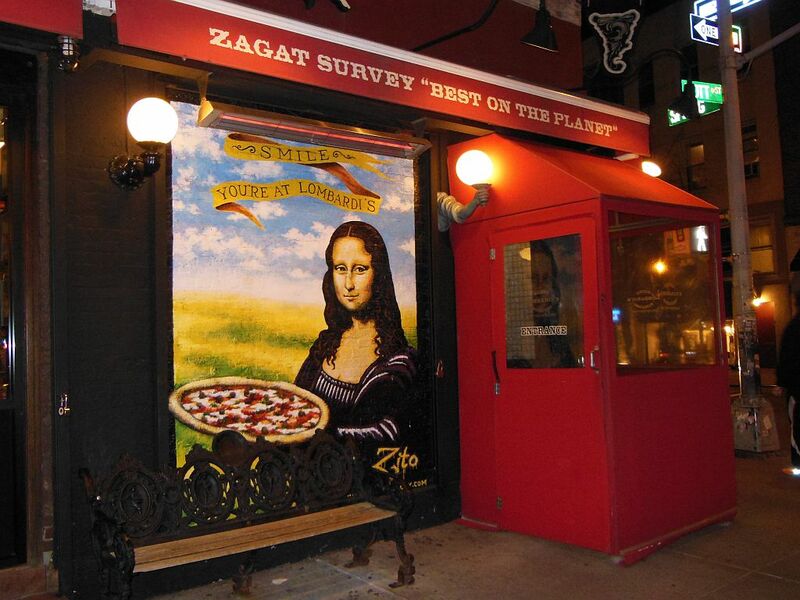 Their pizza menu is pretty simple offering three choices: The Original Margherita or sauce-less options of either White Pizza or Clam Pie, customizable through a handful of available toppings. As soon as I was seated at my tiny table for two, I ordered without hesitation a small (14-inch) six-slicer Margherita for $16.50. When my pie arrived, I was immediately overtaken by its sight, sparkling majestically atop a pizza stand. My mouth began to water from the delightful smoky fragrance of the coal-blazoned crust. With my first bite it became clear that Lombardi’s pie is all about the crust—thin and crisp and wonderfully chewy and flavorful. I wound up finishing off the light and not filling pie in record time. The tomato sauce looked as if it were (and may have been) gently brushed on top of the dough. The wonderfully-fresh mozzarella cheese was scattered atop the sauce in a few blobs and covered less than half of the pie. Tender yet subtle sprinkles of fresh basil and Pecorino Romano enhanced the dominantly delightful smoky taste of the crust. 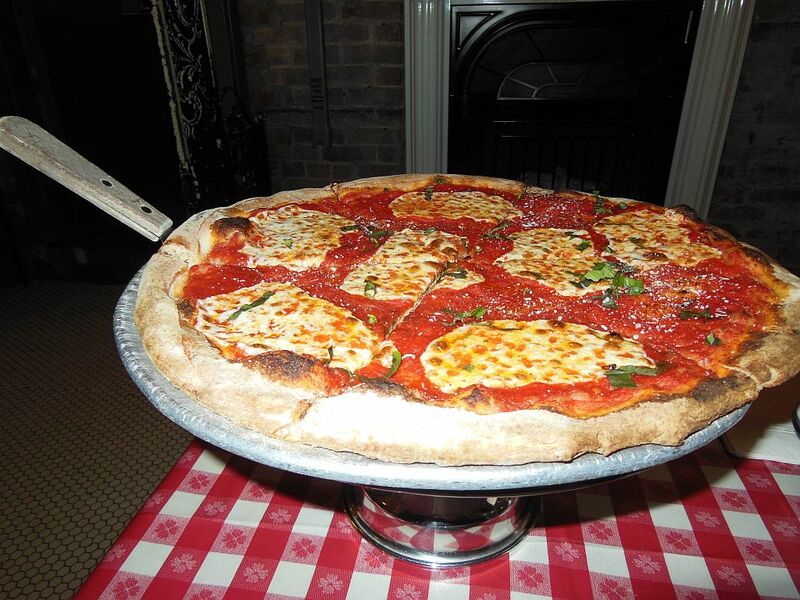 Although this was not your classic NY-style pizza that The Pizza Snob generally favors, Lombardi’s pie is an absolute must for any pizza lover. How refreshing that in this era where many of our traditions have become over-commercialized, Lombardi’s has remained classy and original instead of just another tourist trap. The service and food quality speak for themselves. Finally, for some particulars, there is an ATM onsite if you forget to bring cash which is all they accept. If you live nearby, they also offer free delivery—by bicycle! When The Pizza Snob gets around to creating a Pizza Hall of Fame, Lombardi’s will certainly be one of its inaugural members.